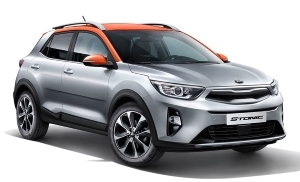 Kia Stonic (YB CUV). 2017 to date (prod. n/a). 5-door SUV. F/F, 998 cm³ (I3 DOHC), 1248, 1368 cm³ petrol, 1582 cm³ diesel (I4 DOHC). Oddly named small crossover, its name a contraction of speedy and tonic, on the Kia Pride (YB) platform. Diesel only at launch in Korea. Kia focused on a stiff bodyshell, and safety including airbags, rapid-braking alarm, and torque vectoring. No four-wheel drive at launch. Easy to use infotainment, and attractive interior. Engines felt gruff, but a good balance between ride and roadholding.